Released just this fall, Spectra is a no frills slot machine game, but calling it boring would be the opposite of what this player experienced. It’s a slot game brought back to the basics, and that enables it to focus on what really matters. There might not be Free Spins or bonus rounds, but the wilds can get you a win of up to €24,000. There are 5 reels and 30 paylines. The minimum bet is 10p and the maximum is €100. The house has an edge of only 3.6%, which seems pretty fair. And as mentioned, the maximum win is 2400 times the total bet. You can find the games on rooms like Mr Green Casino. There’s one main feature in the game that can really make your day. That’s the wild symbol. It takes the place of four symbols and it has special features as well: wild respins and wild nudges. The wild symbols give you Free Spins while the wild symbols themselves remain on the reels. If you get a new wild symbol after the respin, it will also lock down on the reel and the other three reels will respin. The wilds will keep stacking until all the reels are filled or you get no new wild symbol that would give you a respin. And the best part is that this occurs quite regularly, which keeps the excitement up. The wild symbol also substitutes for any other slot symbol. Each time you get a wild symbol in the respins, the wilds will “nudge” up or down by one symbol, providing bigger wins and respins. The best-case scenario is a whole screen full of wilds, if you get really lucky. 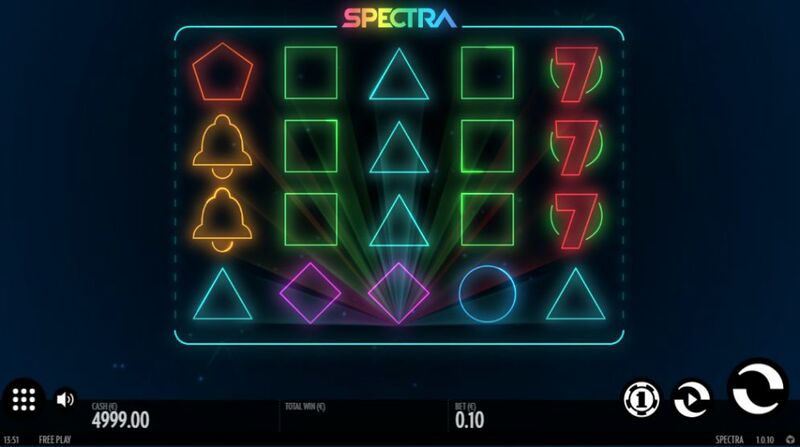 These features make Spectra a fun gaming experience. The game’s theme gives the impression of retro decades brought to the future, kind of what steampunk is to the 19th century – you could maybe call it sci-fi-punk. It’s as if the spirit of the 80’s was put in a futuristic sci-fi movie-like setting. Some of the symbols are from oldie-but-goldie slot games like Golden bells: BAR, 7’s and the four-leaf clover, which is the best paying symbol in the game. Other symbols are diamonds, circles, pentagons, squares and triangles. The symbols have a mystical glow about them, creating the sense of a sci-fi like atmosphere. So hop on, if you’re up for a ride in a casino from the past set in the future, accessible only in the present.